Last night, I dreamt that I was perched up on a tree branch overlooking some hills and people living in that area. It was day time and felt like a warm summer day. I was seated alone up on top of the tree branch. This was a favorite pastime that I used to do when I was a child. As I was sitting there just taking in the view, I heard some giggles and laughter come from beside me. As I turned to my left, I noticed a young boy (?Murugan). I was surprised to see him since I thought I was alone. Strangely, by the look in His sparkling eyes and His glance, I gained such an indescribable comfort. He looked at me as if He knew who I was and was smiling and laughing. He had dark black shoulder-length hair, was bare-chested, and wearing a cream-colored veshti worn like the male field workers in India. His laughter then settled and He jumped from the branch that I was perched on. Curious to know who this boy was, I jumped after Him. As I jumped, the branch from which I was perched upon must have been high, because I had to crouch down with my knees to absorb the impact of my fall. As I recovered from my jump and stood erect, I could no longer find that boy. However, in the exact location where the boy once stood (when I saw him from above while I was still in the tree) was another Being. I was greeted by the most beautiful and glorious sight! 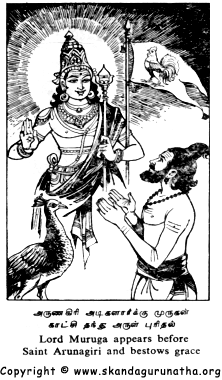 It was Bhagavan Sri Skanda in all His divine glory!!! He looked absolutely charming and beauuuuuuuuuuuuuutiful! No amount of words can describe or capture the essence of His divine form! He appeared not as a child but rather stood in His princely adult form before me, holding His ever-present Vel in His left hand and His right hand in the Abayahara mudra. I immediately thought of the Arunagirinathar picture [See below]. He looked exactly as above but He was not a cartoon! He was real! His crimson-colored pink-hued complexion was breath-taking. He looked like the Hilda Charlton book cover [see picture on right]  wearing His gold-colored silk veshti and sparkling jewels. His beauty was beyond the description of words! He did not speak anything to me but kept smiling at me and all I remember was looking at His Abayahara (fear-not) mudra of His right hand. Tears began to flow from my eyes and I wanted to embrace Him. 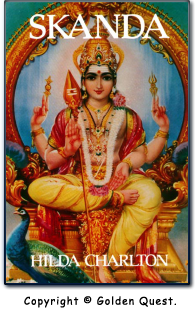 As I took a step forward to do so, Lord Murugan immediately turned into a big Jyoti (light) that was circular in shape. I felt as if the Sun had come down from above and was right in front of me. I had to shield my eyes from the brightness but I was still able to glance at the Jyoti. The Jyoti rose up into the sky and then divided itself into a million different sparks that emanated from the circular Jyoti. Each of those sparks entered the life-forms that were present before me. One spark entered a tree, another entered a plant, another entered a deer, another entered into a few humans that I saw from a distance. Each of His sparks entered into everything that I saw before me and then disappeared into thin air. It was such a profound and wonderful experience. It was as if God Skanda was saying (though He didn't utter a single word), "I am in All, above All, and of All. For all forms are mine and I am all forms!  Infinity is my nature for I am Omnipresent." Upon coming to this realization, I awoke. Oh My Beloved Muruga! What an ocean of compassion and kindness you are! For what reason did you come but of your own free will to come and bless this pitiable earthling (me). How fortunate am I to have your blessings and be part of your divine Lila. No amount of thank-you's will ever suffice to show the level of gratitude that I have for all that you have done. All these wonderful experiences you have graciously bestowed upon this fool (me) with, what can I ever do to ever repay them? I thank you millions and millions of times (anantha-kodi namaskaram) my ever-loving and ever-bountiful Lord. Ammaa-vum nee. Appaa-vum nee. Guru-naathanum nee. Deivam-mum nee. May this fool (me) be one day be fit to be called your devotee and attain that fragrant divine lotus feet of yours, which my soul has longed for in this and all my previous births. By so doing, may my soul finally rest in peace. Your child (who longs to return to his true beloved Mother and Father).